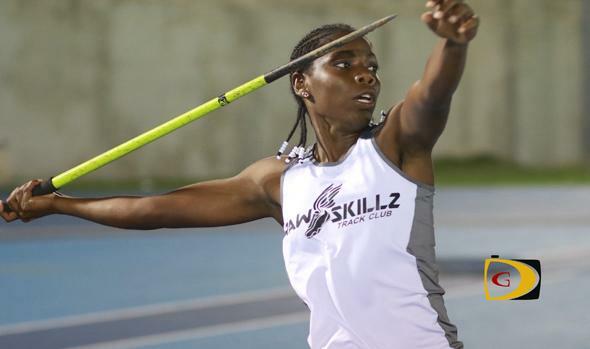 Virgin Gorda's Raw Sillkz Track Club member Britney Peters might be new to track and field, but not to British Virgin Islands sports. The soon to be 19 year old is a Soccer goalie and has played on the BVI Jr. and Sr. Women National teams. She plays with the Avengers in the BVI Football Association League. Peters took up track last April after the 2015 Soccer season ended after joining the Raw Skillz Track Club. She had her first competition in Miami last June and threw the Javelin 35.26m. It was the fifth best mark by a BVI female. "I wanted to maintain my fitness, get stronger for soccer and I wanted to keep training so I wouldn't fall behind because I'm to try and get out of here by September on a scholarship," said Peters who started Soccer at 12. During Friday night's BVI Athletics Association Development Series meet, Peters heaved the 600g spear out to 37.39m, throwing into a strong cross wind. That mark vaulted her No. 3 on the BVI All Time List. "I know I have the ability to do good," she said. "I have the arm strength and my hands are good. Of all the events I've done-800m, 1500m, Shot Put, Long Jump, Javelin Throw-I like the Javelin best. I find it interesting." Sprinter Tahesia Harrigan-Scott tuned up for the Mar 17-20 IAAF World Indoor Championships in Portland, Ore., with a 60m victory in the Great Dane Classic in New York on Saturday. She had a winning time of 7.33 seconds, after running 7.39 in the prelims. Harrigan-Scott-who won the bronze at the 2008 championships, was a 2010 finalist and missed the 2012 final by .0001-has qualified for Indoor Worlds for a fourth successive time. Karene King finished seventh in the same race in 7.62 after 7.59 in the prelims. She won her 200m heat in 24.15 seconds to finish second overall. IAAF World Youth Championships semifinalist L'T'Sha Fahie, had non advancing times of 7.65 and 25.43 in the 60 and 200m respectively. Ashley Kelly won the 400m in 54.96 seconds. She's coming off a 60m personal best of 7.46 seconds last week also in New York, becoming the BVI's second best performer at the distance behind Harrigan-Scott. Tarika "Tinker Bell" Moses won her heat in one minute 13.21 seconds and placed third overall in the 500m. Lakeisha "Mimi" Warner was fifth overall in 1:14.88, after winning her heat. Jonel Lacey also won her section with a time of 1:16.28, the 11th best mark of the competition. St. Augustine Jr. Khari Herbert lowered his BVI Indoor Record 400m record from 47.92 seconds to 47.71, in finishing third overall in the Virginia Tech Invitational on Saturday. In Alabama, Ronique Todman ran 7.20 seconds in the 60m dash and Adaejah Hodge, 9.14 second in the 9-10 division.